Feeding chickens is a straight forward task and there are of course a number of different feeders available for the poultry keeper, whatever the flock size. The challenge soon becomes ensuring that your chickens are the ones getting the food and not the local squirrel, crow, rook, pigeon, rat or mouse population! Poultry feed is expensive and even a modest amount of feed being wasted daily will soon add up over the course of a month, not to mention the associated risk of disease when rats or wild birds are involved. I have used many different feeders over the years but have never tried a Grandpa’s Feeder so was very pleased to have the opportunity to try one out on one of my runs of Light Sussex. Grandpa’s Feeders were developed in New Zealand in 1995 and have been sold there ever since. They are now available here in the UK and sold via the Grandpa’s Feeders Website. They work on a simple idea: A rat weighs around 300g, wild birds such as crows even less and the lid of the feeder will only open with a weight greater than about 500g so a chicken can open the feeder to eat but the others cannot! The run in question was perfect for the trial as there have been a number of rooks dropping in for breakfast after I had put the feeders out in the mornings. I was taking the feeders in because I had spotted mouse droppings on the ground near my feeders. Perfect timing I would say to test out a Grandpa’s Feeder! I unpacked and set up the feeder. This is very straightforward and simply involves placing bolts through the treadle plate arms to attach it to the feeder. There are comprehensive instructions supplied on the underside of the lid of the feeder (which is good for me as I normally lose paper instructions) and provide guidance on how to get your hens used to using the feeder over the course of a few weeks and some different settings. The first thing to do is to place bolts in the top position which holds open the lid and of course fill the feeder up. The standard feeder that was used in this test holds 9Kg which is a little under half a sack of feed and can feed half a dozen chickens for 10 days. There is a larger version available that can hold twice as much as well though if you have a large flock. Granpa’s feeders come with a 12 month guarantee and Richard provides fantastic customer support. The bolts are placed in the top holes which hold the lid of the feeder open permanently. This allows the chickens to get used to the feeder and start to feed from it. All other feeders should of course be removed so that the chickens are hungry and more likely to use the feeder. I found my birds were slightly nervous of this new shiny feeder (their normal feeder is green and red) but within a day were eating from it. Once the chickens have got used to using the feeder, the bolts can be moved to position 2 which still partially holds the lid open but opens it fully when they step on the treadle plate. This really spooked them at first as you can see from the photo to the right and they would go to feed, step on the plate and then get startled by the movement. Again, it is training and they soon got used to the slight movement. It is important to keep the feeder full up during this training as it makes the noise of the movement quieter. Once the chickens are used to movement, the bolts are completely removed and full movement of the lid is allowed. At first, I found the chickens were pecking at the lid and I would partially hold the lid open for them until one stepped onto the treadle plate as you’ll see in the photo gallery (my hand is holding it slightly open if you look bottom right) but I found out after observation that my rather large birds could comfortably stand back and reach over the top of the treadle plate to the feed without having to stand on it, so it took mine a little longer than most to get the hang of it. Speaking with Richard at Grandpa’s feeders he said some people have set up their feeder and wondered what the bolts were for as their birds have taken to it so quickly! The whole flock seemed to get the idea after a few weeks. My birds did take a little longer than normal but they soon realised that stepping on the treadle plate meant food and they were quite happy to walk over, step on the treadle and eat when they were hungry. 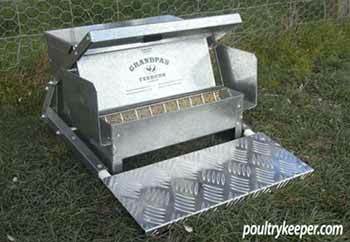 I was impressed with the feeder, it is made to a high quality, fully galvanised and waterproof. In time, it should pay for itself many times by saving food from being eaten by the local wildlife, not to mention the added biosecurity it provides by discouraging them. The feeding area with anti-flick grid to prevent birds flicking feed out. The feeder was topped up. Week 1 The treadle plate is held down and the lid open so that chickens can get used to it.